Cranberries come from evergreen shrubs and are small, shiny pink berries with an acidic flavor. They are a seasonal fruit, but when you dry and store them they become accessible all year. Before the berries are dried, they are soaked in boiling water until their skin splits. They are then drained and tossed in white sugar or a light corn syrup to remove some of the tart taste. The berries are dried in a food dehydrator or baked in the oven and allowed to sit overnight. You can freeze, refrigerate or store the dried fruit in the pantry and use it as an alternative to raisins. Pour the dried cranberries into a plastic bag. Seal the bag closed. Write the date on the bag with a permanent marker. Doing so will remove the guesswork by giving you a definite starting point, which means you will know if the cranberries are still edible. Place the bag in the refrigerator. The cranberries will remain fresh for at least one year. Pour the dried cranberries into a bowl and cover with a lid. Stick a piece of tape on the lid and write the date in permanent marker. Place the bowl in the freezer. 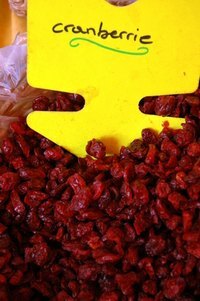 The dried cranberries are best if used within a year and a half of the freezing date. Put the dried cranberries into a plastic bag and seal the bag closed. Or place the berries in a clean mason jar, put the lid on the jar and twist the screw band onto the container. Write the date on the container with permanent marker. Put the container of dried cranberries into the pantry. The fruit will last for several weeks.